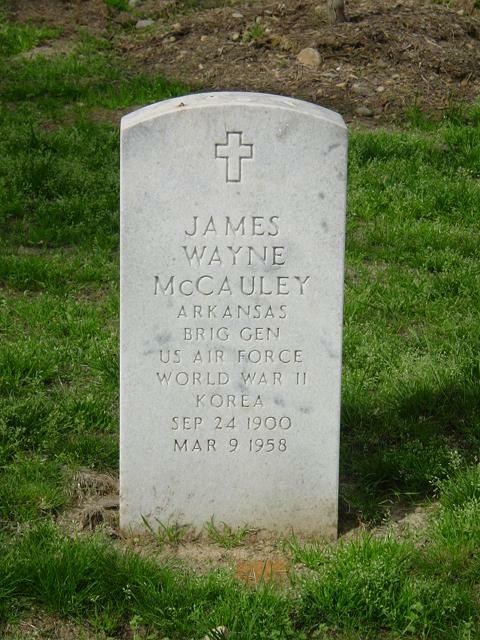 James Wayne McCauley was born in Judsonia, Arkansas, September 24, 1900. He graduated from Ouachita College in Arkansas with a bachelor of arts degree in 1924. Prior to his graduation, he was appointed a Second Lieutenant in the Infantry Reserve May 20, 1923, on inactive status. In February 1928 he enlisted as a flying cadet and after graduation from primary and advanced flying schools at Brooks and Kelly fields in Texas was rated a pilot and commissioned a Second Lieutenant in the Air Reserve on Feb. 28, 1929. He received his regular commission as a Second Lieutenant in the Air Corps May 2, 1929, and was assigned with the 88th Observation Squadron at Fort Sill, Oklahoma. In August 1930 General McCauley became a flying instructor at the Air Corps Primary Flying School at Brooks Field, and in October 1931 moved in that capacity to Randolph Field, Texas. In August 1934 he was transferred to France Field, Panama Canal Zone, where he served successively as adjutant and operations officer of the Seventh Observation Squadron. He became assistant post operations and intelligence officer at France Field in April 1935. General McCauley was assigned in September 1936 as adjutant at Barksdale Field, Louisiana, and in July 1938 became operations and intelligence officer of the 79th Pursuit Squadron, also at Barksdale Field. In June 1939 he entered the Air Corps Tactical School at Maxwell Field, Alabama, and upon graduation two months later assumed command of the 77th Pursuit Squadron, which he commanded at Barksdale Field, La., and Moffet and Hamilton fields, California. General McCauley assumed command of the 55th Pursuit Group at Portland Ore., Air Base in February 1941 and in July 1942 became commander of the Seattle, Wash., Air Defense Wing. In October 1943 he was appointed commander of the 70th Fighter Wing at Paine Field, Wash., and the following month accompanied it to Europe, where he commanded it until the end of hostilities there. In July 1945 General McCauley assumed command of the III Tactical Air Command at Barksdale Field. The following October he became commander of the XIX Tactical Air Command, also at Barksdale Field. In May 1946 he assumed command of Langley Field, Virginia. General McCauley entered the Air War College at Maxwell Air Force Base, Alabama, in August 1946. Upon graduation in July 1947 he entered the National War College from which he graduated in June 1948. The following month he was assigned to Air Force headquarters as chief of the planning group in the Office of the Inspector General. From September 1949 to March 1950 he served as deputy inspector general and then became director of inspection. In February 1951 General McCauley assumed command of the 1003rd Inspector General Unit at Kelly Air Force Base, Texas, and the following October was appointed commanding general of the 32nd Air Division at Stewart Air Force Base, N.Y. He became commander of the 26th Air Division, Eastern Air Defense Force, Air Defense Command, at Roslyn, New York. General McCauley has been awarded the Legion of Merit, Air Medal, French Legion of Honor and Belgian Croix de Guerre and Order of Leopold. He is rated a command pilot, combat observer and aircraft observer.